Mark your calendars for an afternoon of fun at The Heights of Summer, our second annual street party! 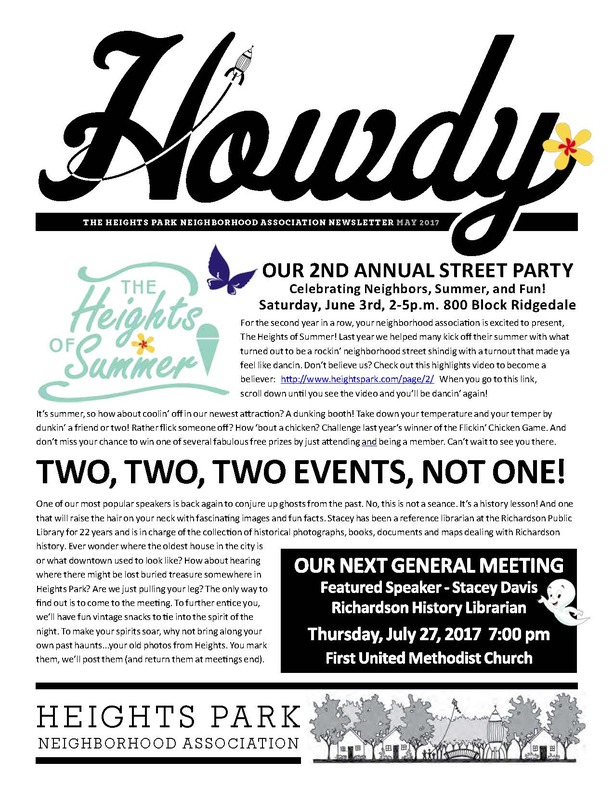 There will be free snow cones, a bounce house, dunk tank, scavenger hunt, raffle prizes for Heights Park Neighborhood Association members, and so much more for the whole family from 2-5 p.m. on Sunday, June 11 on the 800 block of Ridgedale Drive. Click here for a full-size flier to print, text or email. This event is brought to you by the Heights Park Neighborhood Association. All residents of Heights Park are invited. Video courtesy of Jeff Davis Photography. Thanks, Jeff! Our 2nd Annual Street Party on Saturday, June 3. The next General Meeting on Thursday, July 27. A recap of the General Meeting on Feb. 4, featuring Burton Gilliam, star of “Blazing Saddles” and Dallas-Fort Worth resident. Tips for caring for your trees. The history and efforts of Heights Park Neighborhood Association. We are deeply grateful to the Heights Neighborhood Association for selecting our garden as The Yard of the Month Winner for May. The Roberts Family has been in this home for 50 years. 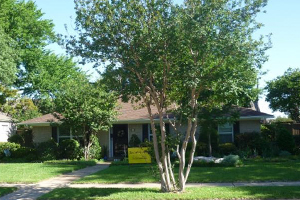 Our landscaping in front began with a row of bushes and two ash trees. As the trees weakened over the years we replaced them. One landscaper planted an oak for us and another landscaper planted a Chinese tree. With the shade gone, we began to envision a colorful artistic flower garden. Kevin Shockley of Southern Pride Landscaping came into our lives at this time as a result of a recommendation by my neighbor. 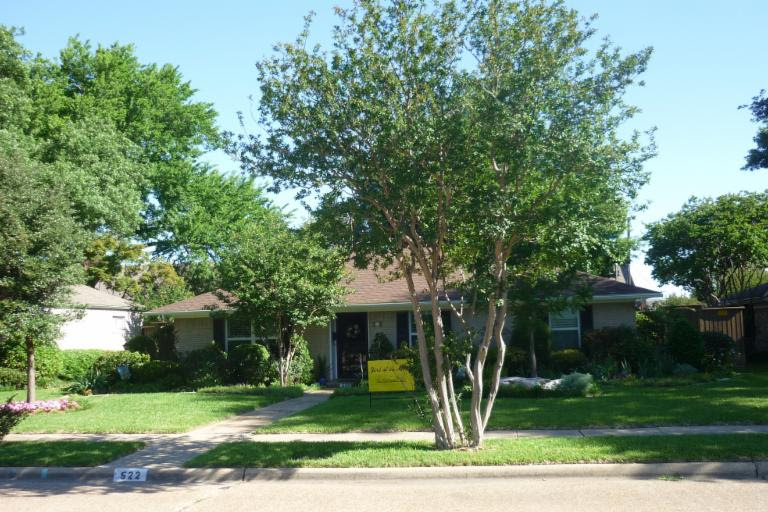 Kevin gradually transformed the garden over a period of several years by expanding spaces, shaping bushes and adding colorful perennials and annuals. This year another of my neighbors let me know her granddaughter was selling flowers to benefit the Girl Scouts. I purchased several flats and these became the pink display under the oak tree. It truly took the neighborhood to raise this garden and we thank you one and all.